I don’t want to jinx anything, but this feels like the week things are beginning to take a turn for the better around here. The weather, for one, is looking much more promising; the sun bursting through the clouds this afternoon had jangly summertime song lyrics bouncing through my head. Sticking to my Lenten resolution has not been as painful as I might have thought (possibly because I have been compensating for the lack of baked goods with sushi and potato chips in equal measure), and I have found that going largely, although unscientifically, gluten-free has made me feel more clear-headed and slightly less fatigued. My children and I are all germ-free for the moment, and my husband and I have been spending what feels like a gluttonous amount of time together. As the kids say, it’s all good. My week so far has also included a couple of bits and pieces of good news, which I will have to keep under my hat for the time being, but we are celebrating around here nonetheless with (what else? )cake: this flourless cake. 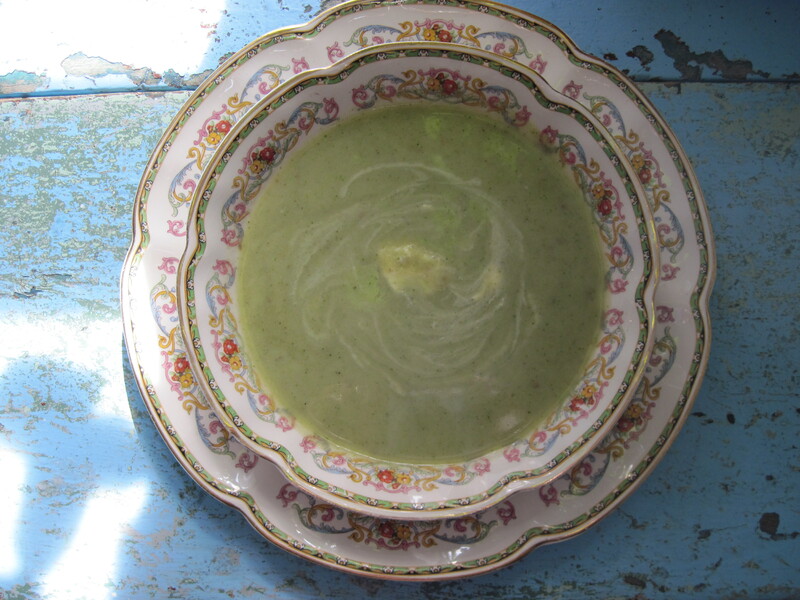 And this pale green soup, which will counteract the cake and put a little virtuous spring in your step. This is adapted from a great basic cookbook called Whining and Dining, by Emma Waverman (yes, that Waverman!) and Eshun Mott. I can never bring myself not to fiddle with their recipes, but my husband follows them to the letter and the results are always perfectly good. In a large pot set over medium heat, melt butter. Add onions and cook for 5 minutes, stirring occasionally, until just beginning to colour. Add broth and potatoes and bring just to a boil; then simmer, uncovered, until potatoes are tender-crisp, about 10 minutes. Add broccoli and return to a simmer. Continue to simmer 8-10 minutes, until vegetables are very tender. Add coconut milk to pot, and use an immersion blender to blend until smooth. Season with salt and pepper as desired.